As the new school year approaches, many of our clients have been extremely helpful in advising which new features they’d like to see in Camayak, to help them do their jobs more effectively, throughout their busy production weeks. Here are three things we introduced today, as a result of that feedback. Revision-tracking. 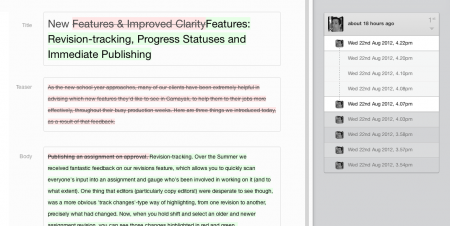 Over the Summer we received fantastic feedback on our revisions feature, which allows you to quickly scan everyone’s input into an assignment and gauge who’s been involved in working on it (and to what extent). One thing that editors (particularly copy editors!) were desperate to see though, was a more obvious ’track changes’-type way of highlighting, from one revision to another, precisely what had changed. Now, when you hold shift and select an older and newer assignment revision, you can see those changes highlighted in red and green. Desk activity and assignment progress. One of the biggest benefits to using Camayak is that everyone in your newsroom can be on the same page (literally) within a few clicks. Part of making that work, is letting editors have a quick insight into how much work each of their desks has got and what stage each of their assignments is at, so they can focus on the things that are lagging and balance the workload across their staff. 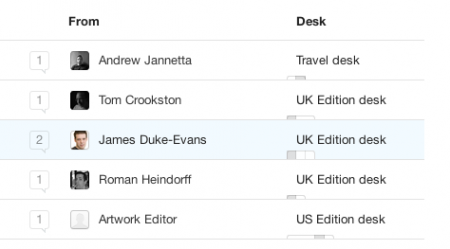 To aid that, we’ve added a ‘desk’ column to everyone’s dashboard and the archive page, so that it’s clear which desk each assignment belongs to and how far along it is in production. This matches the way we indicate assignment progress on the calendar page. Publishing an assignment on approval. 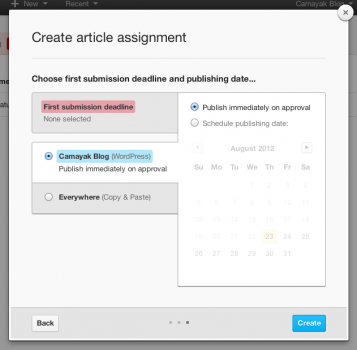 We’ve always enabled people to schedule their assignments for publishing on a future date and at a specific time. What we noticed however, was that people were skipping the scheduling process, as a result of wanting to publish the assignment ‘as soon as it was ready’, as opposed to knowing precisely when they’d like it to go live. We’ve now added the option to publish your assignments immediately on approval, to give editors the option to add more urgency to an assignment than merely leaving it ‘unscheduled’. We’d especially like to thank the Kansas State Collegian staff, for their insights on all these issues.